October Holiday Hiring Best in 14 Years | Challenger, Gray & Christmas, Inc.
Holiday hiring got off to its strongest start in 14 years, as retail employment grew by 159,500* in October, according to an analysis of the latest Bureau of Labor Statistics data by global outplacement firm Challenger, Gray & Christmas, Inc. The 159,500 net new jobs in retail last month marks a 6.7 percent increase from October 2012, when retailers increased their payrolls by 149,400. It was the most new hires in the first month of the annual holiday hiring period since 1999, when retail employment expanded by 172,200 in October. The strong start bodes well for a holiday hiring season that stretches from October through December, with the heaviest retail workforce additions, typically occurring in November. Last year, the three-month hiring period resulted in 751,800 new jobs being added by retailers; the most since 2000, when retailers added 788,200 workers during the final three months of the year. Last year’s holiday hiring binge brought retail employment in the sector to 15,538,300 in December, the month in which retail employment generally reaches its annual peak. That was the highest number of retail workers in December, since 2007, when employment reached 16,156,400. “Strong October hiring does not necessarily mean that holiday hiring will surpass last year’s level, but it is certainly a good sign. We have seen steady increases in the number of seasonal workers hired since 2008, when recession-ravaged retailers added a paltry 324,900 seasonal workers in the final quarter of the year. Last year, holiday hiring returned to pre-recession levels. Actually, 2012 returned to pre-2001-recession levels, as retailers turned in the strongest hiring numbers since 2000,” said John A. Challenger, chief executive officer of Challenger, Gray & Christmas. “So far, the 16-day federal government shutdown does not appear to have had any impact on retail hiring plans. 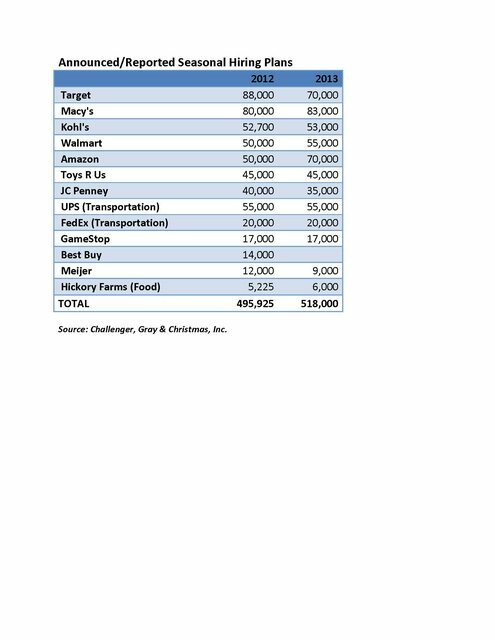 We have seen fairly significant hiring plans announced by several major national chains, including Target, Walmart, Macy’s, Kohls, and JC Penney. Online retailer, Amazon.com, is reportedly adding 70,000 holiday workers, up from last year’s 50,000,” he noted. Consumer confidence remains shaky in light of political discord in Washington, but consumer spending has still managed to see gains. Retail sales, excluding automobiles, gasoline and building materials, increased 0.5 percent in September, improving upon the 0.2 percent increase posted in August. Meanwhile, the National Retail Federation is expecting holiday sales in November and December to increase by 3.9 percent in 2013, up slightly from last year’s 3.5 percent holiday sales growth. 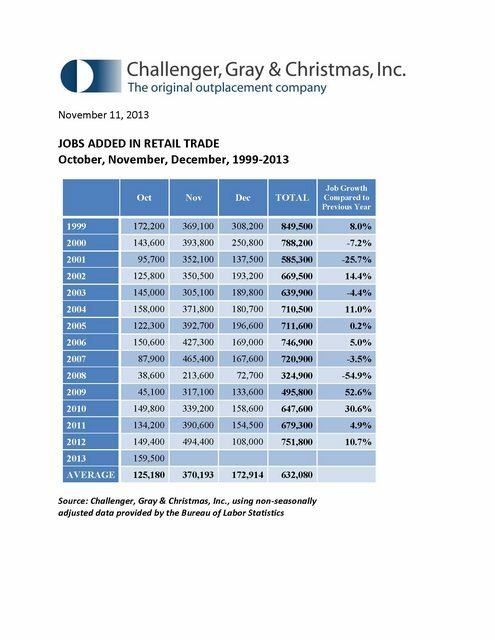 *The change in employment is based non-seasonally adjusted data for the entire retail sector from the U.S. Bureau of Labor Statistics.